Merchant level salespeople (MLSs) who build profitable merchant portfolios know how to understand merchant pain points and sell solutions that address them. Most, however, are not attorneys. That can cause problems, as their fortunes typically are tied to the particulars of contracts they sign with upstream partners. And those contracts are anything but simple. "The opaque nature of the acquiring business lends itself to companies taking advantage of people without [adequate] information, such as sales agents and small ISOs," said Theodore Monroe, a Los Angeles-based attorney specializing in payments law. "A lot of ISOs and agents trust their processors." But for those [processors] it's a business, and they can and do take advantage of downstream partners, he added. "The little guys don't know what they don't know, and they can be easily duped," noted Holli Targen, a partner in the Southfield, Mich., offices of Jaffe Raitt Heuer & Weiss, and chairperson of the firm's electronic payments law group. Typically, those getting the short end of a contract don't realize it until something drastic happens, like residuals stop flowing in. It's hard to sue for a perceived contract breach if your $20,000 a month residual stream is cut off, Monroe said. The best way to avoid this is to hire an experienced attorney to review contracts and help negotiate a better deal. It's far more cost-effective than hiring attorneys to file lawsuits. Hiring an attorney after the fact "can cost at least 10 times as much as getting one to look at the contract" before it's signed, Monroe said. Targen concurred, adding, it's "a good upfront investment" to have a contact reviewed in advance. James Shepherd, founder and president of CC Sales Pro, suggested MLSs and ISOs can improve their negotiating positions by agreeing to compensation based on performance benchmarks, at least in the beginning. "When negotiating a contract, in order to get what you want, don't be afraid of performance-based ramp-ups," he said. "Just be realistic." For example, Shepherd added, a contract might call for a 50 percent split of residuals until the agent reaches a set number of signed merchants per month, at which time they qualify for a 55 percent residual split. The split would continue to increase at predetermined intervals of monthly new accounts added. But even these arrangements can contain gotchas. "One thing to look for is whether the split can get reduced if you stop selling that many new accounts," Shepherd warned. Integral to the negotiation process is the need for exit strategies should an ISO, MLS or upstream partner want out of a contract, as well as an understanding of what that means for residual streams. "All too often, the ISO or agent doesn't consider how it [the relationship] is going to end," Shepherd said. What if an agent decides to retire, or worse, gets incapacitated? Contracts should guarantee residual streams for as long as merchants the MLS signed generate residuals for the upstream processor or ISO, Targen said. That's not always the case, Shepherd added, stating, "The question to ask is what happens if a year from now I'm hit by a bus and I can't sell – am I still guaranteed my residuals? If they say yes, make them show you that in the contract." Or what if an agent decides to sell a portfolio? Some upstream ISOs and processors want a right of first refusal. Shepherd suggested this can work to an agent's advantage, but only if the offer is for a good multiple. Targen advises clients to instead offer a right of first bid. "It's up to the agent to inform the ISO/processor of their intention to sell and give them an opportunity to bid on it. If they like the bid they can take it," she said. Then there are forced exits. Anecdotes abound of ISOs and MLSs who discover, to their dismay, that an upstream ISO or processor owns their residual streams and can sell them at will, paying the downstream partner who sold the accounts a set multiple of monthly residuals – if anything at all. Another variation is when the upstream partner merges with another processor that the ISO/MLS doesn't want to work with – perhaps because of past bad experiences. According to Targen, if an upstream partner sells its business to a larger shop, ISOs and MLSs should have the option to sell their book along with the processor and get paid for it, or continue to do business with the new owner. Exclusivity clauses. Many processors want ISOs and MLSs to sell for them exclusively. "No person in this industry should sign an exclusivity agreement," Targen counseled. "It's not ideal for an ISO or agent to have all their eggs in one basket. If the relationship goes south they're out of luck." Shepherd doesn't rule out exclusivity clauses, provided the agent is compensated accordingly. "If you’re going to be exclusive with somebody you’d better be getting something for that," he said. Non-solicitation clauses. These are commonly intended to keep ISOs/MLSs from soliciting merchants away from the processor with which they were boarded, or just moving signed merchants from one processor to another. Such non-portability clauses can be a deal breaker for many small ISOs and MLSs. "Portability is the gold standard," Shepherd said. "This is why we have mega-ISOs." What if a merchant becomes dissatisfied with the processor, perhaps because the processor lacks technology or services they require? If an upstream partner insists on a non-solicitation clause, include language in the contract that allows the ISO or MLS to move merchants under certain, specified conditions, Targen said. Residual stream ownership and verifiability. "Anything in a contract that says the residual can be cut off is open for negotiation, and I'd negotiate real hard on that," Targen said. It's also advisable to include language requiring residual reporting and steps for verifying the accuracy of residual payments. "They should get detailed reports and [authorization to] review the books to confirm that what they're being paid is accurate," she added. Many processors and ISOs want to impose minimum payment amounts before sending out residual checks. "There's no reason for that," Targen said. If a processor insists on minimum payments, make sure they are realistic and for a limited period of time. Also, watch out for clauses stating residual cuts can be reduced or eliminated if totals fall below an established minimum. "The contract should be very clear in stating that the ISO/agent shares in all revenues derived from the merchant," Targen said, adding that some ISOs and processors can and do "monkey around with" this. Limited liability and indemnity. Limited liability clauses limit the liability of one party to a contract. Large ISOs and processors will always seek to limit their liabilities when contracting with downstream sales partners. But under no circumstances should this effect residuals. "It's really important that if there is a limited liability clause, that an exception to this is the payment of residuals," Targen said. Indemnity clauses allow one party in a contract to sue another for monetary damages even if the purported harm was the fault of a third party (for example, a merchant). These should be limited to "direct damages," like out-of-pocket costs, and not inclusive of "special damages," like loss of profit, Targen noted. Breach of contract. A small ISO should never be shut out of a contract because of one employee's mistakes. Provisions for remedying these problems, such as terminating the errant employee, should be clearly spelled out in contracts. "A breach of one employee should not constitute a breach of the entire agreement," Targen said. Responsibility for merchant fraud, data breaches. This is generally not a consideration, as most small ISOs and MLS have "no risk" agreements with upstream partners that protect against liability for merchant fraud and data breaches. But it's a good idea to ensure this is clearly articulated in the contract. "They need to make absolutely certain the ISO or agent is not going to be held liable," Targen said. Termination provisions. Termination clauses can profoundly impact an ISO's or MLS's business, so be sure reasons for termination or cancellation are clearly articulated. "Some companies will terminate a contract when an ISO or agent stops bringing them business," Monroe said. This is never a good idea. 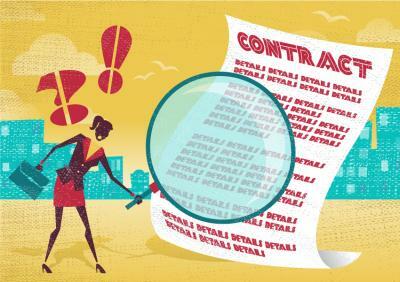 Reasons for terminations should be clearly stated in the contract, and advance notification is a must. "It's important that agents not be put in a position of having to react in a panic," Targen said. "Four to six months advance notice of termination allows them enough time to get something else in place." Responsibility for setting, changing merchant fees. Typically, it's the responsibility of upstream ISOs or processors to set fees, but assurances can be had. "Confirm in your agreement that the processor cannot change the fee arrangement or add new fees," Targen said. For more insights into issues associated with ISO/MLS contracts, check out the Legal Ease column by payments attorney and long-time Green Sheet contributor Adam Atlas. His most recent article associated with this topic, "ISO contract management in the digital age," is in our archives at www.greensheet.com/emagazine.php?issue_number=180601&story_id=5727. CannaCard , CannaTrac Technology Inc.